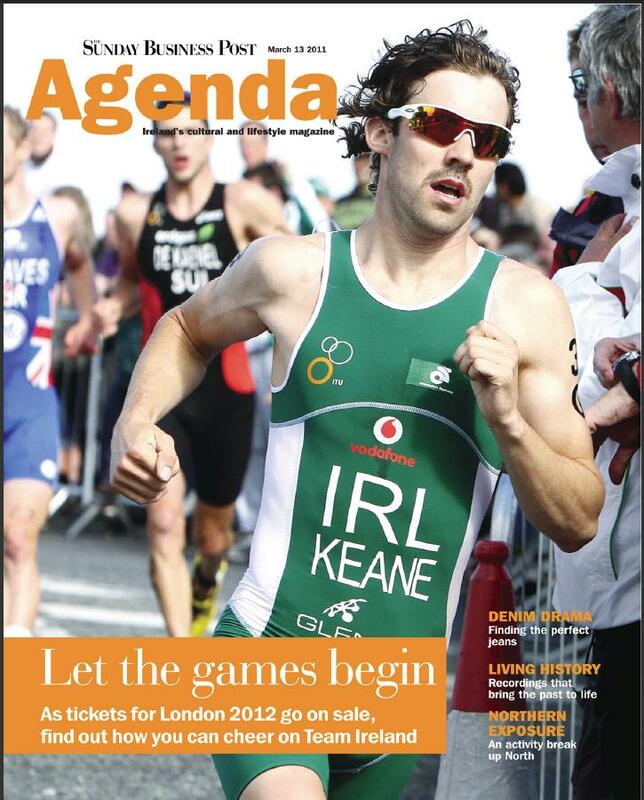 Here’s my Agenda cover on the 2012 Olympic Games from a week or so ago. For some reason, when The Post updates its website, panel pieces have a tendency to be left out, so I’ve included them here. There may be just under 18months to go to the opening ceremony of the 2012 Olympic Games, but for anyone considering a trip to London to cheer on the Irish team, next Tuesday is an important date. On that day, applications open for tickets for the Games, and with the event just an hour away by plane, demand for tickets is expected to be huge. To get to London 2012, Irish fans will have to compete in a lottery-style ticket allocation system for all but the most niche interest sports. ‘‘The reality is that there are no 500,000-seater stadiums, so unfortunately, not everyone will get to see the events they want to see,” says Stephen Martin, chief executive of the Olympics Council of Ireland. ‘‘Generally, the most popular events from A ticketing point of view are the ones that are really dramatic. Athletics is extremely popular, and the finals of events like the 100 metres and the relay races towards the end of the athletics programme are all prime events. ‘‘Everyone wants to see the same batch of events, and the finals are always oversubscribed in pretty much every discipline. It’s easier to see the early rounds of most sports, most notably those like football where there are big stadiums. For the city of London, the prospect of welcoming hundreds of thousands tourists for the Games, in addition to those who are visiting the city for other reasons, represents an unparalleled promotional opportunity. Visit London estimates that around 320,000 international visitors will travel to Britain for the Games, but is unable to predict just how many will come from Ireland. ‘‘We have done research which says that the appeal of, and interest in, the Olympics is just as high in Ireland as it is here in Britain,” says French. ‘‘That would suggest that a lot of Irish people are likely to visit, probably more than from many other countries. Games come around, we should have around 120,000 hotel rooms available in London itself,” she says. ‘‘It’s likely that once the tickets are on sale, people will start looking for accommodation, so there will probably be a rush. It’s worth looking ahead for accommodation, but bear in mind that many hotels haven’t yet released prices. Keep an eye on the different hotels – once one or two of them start launching Olympic packages, then they all will. ‘‘There are quite a few of the budget chains, such as Travelodge, that offer great value for money, and groups can often benefit from self-catered apartments. With any large event, it’s not unusual for the hospitality industry to capitalise on increased demand by pushing prices up. However, efforts have been made to try to keep this to a minimum. ‘‘We’ve been working on a fair pricing and practice charter, predominantly aimed at the hospitality and events industry,” says Jacqueline French. ‘‘What we’re saying is that this is our chance to showcase London, and we’re encouraging people not to mess that up by hiking prices. Getting around London is relatively easy, if sometimes time-consuming. Ideally, visitors will attempt to base themselves near the locations where their chosen sports are scheduled to be played. The main Olympic village itself is in Stratford in east London, and it is in this area that the main events, including athletics, swimming and cycling, will take place. ‘‘Some of the other sporting venues in London will also be used, such as Wembley Stadium for football and Wimbledon for tennis,” says French. ‘‘Tennis isn’t such a popular Olympic sport, but getting tickets for Wimbledon itself is often very hard, so this is an opportunity for tennis fans to watch top-tier tennis in Wimbledon as part of the Games. But just how many Irish athletes will be heading to London 2012? ‘‘Traditionally, we take part in ten to 12 sports, and send 40 to 50 athletes to the Olympics. London looks like it will shape up similarly,” says Stephen Martin. Martin says the fact that the Games are Taking place to close to home will probably mean more to spectators than it will to competitors. ‘‘Proximity to Ireland doesn’t really make a huge difference to our efforts – we still have to qualify in each event,” he says. According to Martin, there is strong potential for Irish representation in athletics, badminton, boxing, canoe slalom and flat water, road and track cycling; equestrian events including showjumping and eventing; judo; modern pentathlon; rowing; sailing; swimming; shooting; triathlon and taekwondo. ‘‘In athletics, we have quite a few potential qualifiers, with around eight athletes and a relay team. These eight include a couple of walkers – Robbie Heffernan and Olive Loughnane – who finished in the top eight in the world and Olympic Games in the last few years. We also have David Gillick and Derval O’Rourke, who made the finals in the European or world championships in the last few years, and Paul Hession, who has made the semi-finals in the 200 metres,” he says. ‘‘They are the athletes that most people would expect to qualify and do well, and there will be quite a few people looking out for them. Badminton players Scott Evans and Chloe Magee, both of whom competed in Beijing, are seeking to qualify again. ‘‘In boxing, the national champions are preparing for the world championships, and that’s the first opportunity they will get to qualify,” says Martin. ‘‘We have people like Paddy Barnes, who has maintained a consistent level since Beijing and who has gone on to win medals at the European championships and Commonwealth games. Because Joe Ward beat Kenny Egan in the national championships, he will be going to the world championships, and Kenny Egan won’t. If Joe secures a quarter-final placing, that will qualify him for the Olympics. Katie Taylor is probably Ireland’s most high-profile Olympic hopeful, while her fellow boxer John Joe Nevin is also aiming to qualify for London. ‘‘John Joe was the first to qualify last time around for Beijing, and he won the national championships this time around as well,” says Martin. Other Irish Olympic hopefuls include road cyclist Nicolas Roche, Beijing Olympian Eoin Rheinisch in the canoe slalom, and flat-water canoeist Barry Watkins. ‘‘In the equestrian events, we have Denis Lynch and Billy Toomey, who are in the top 15 in the world showjumping rankings, as well as eventing riders Jane Doherty, Captain Geoff Curran, Sam Watson and others. Natalya Coyle will hopefully qualify in the modern pentathlon, while Lisa Kearney is well on her way to representing Ireland in judo, and is currently ranked ninth in the world,” says Martin. In rowing, Ireland’s hopes rest with a largely new team which is under 23 years of age – the experienced rowers retired after Beijing, leaving the field open to a new generation. In triathlon, Aileen Morrison has won medals on the world cup circuit, while in sailing Peter O’Leary won the Skandia Olympic Test event last summer in Weymouth in the star class. ‘‘In some events, you either qualify or you don’t, but in others there is more time to approach qualifying from a few different angles,” says Stephen Martin. Approximately 8.8 million tickets will be made available for the 2012 Olympic Games, with applications being accepted between March 15 and April 26 2011. To get tickets, applicants need to visit a special ticket website to register their interest. For sessions where demand exceeds supply, the organisers have said they’ll use an automated and random selection process to ensure the fairest allocation of tickets. People successful in securing tickets can pay for them between May 10 and June 10, with prices ranging from £20 up to an eye watering £725 for some of the most high profile finals. Prices average at around £90. With several world class wins under her black belt, 21 year old Northern Irish Judo competitor Lisa Kearney is well on her way to the 2012 Olympic games. Currently ranked at 9th in the world in her category, she easily falls inside the qualifying cut off point of being within the world’s top 14 competitors, but in order to make to the games she has to maintain this position between now and the start of the event. Kearney has relocated from her home in Belfast where she trained with the Yamakwai Judo Dojo to Edinburgh where she now trains full time with the British squad. Kearney has been practicing Judo for 13 years, since she was 8 years old, and believes that an early start is definitely an advantage when it comes to stepping up to the standard of judo found at the Olympic games. One challenge all Olympic athletes face is how to fund the in depth and often full time training required to compete on the international stage. “It’s very expensive to do what I’m doing. I’m attending university in a part time capacity, but I’m doing it really slowly and fitting it in around training. My parents help me out, I get some grant money in Northern Ireland but I’d love to be sponsored,” says Kearney. Born in Carlow, the 25 year old Sam Watson is currently based in the UK, where he is in intensive training for his chosen equestrian discipline of three day eventing, along with his horse Horseware Bushman, or George, as he is otherwise known. “Sports eventing is like the pentathalon in athletics except for horses. We do three phases – dressage, show jumping and cross country – and I think the cross country is the centrepiece of the sport,” says Watson. Watson is considered one of Ireland’s best hopes for qualification, although he narrowly missed out on winning an automatic place at the Olympics at last year’s world games. “There was one event last year, the world games, which offered a one off chance to qualify straight away and we narrowly missed that – we finished seventh and the top six automatically qualified. To make matter worse, we were sitting in sixth place for most of it and lost out at the last minute,” he says. Like other Irish Olympic hopefuls, Watson would love to see more sponsorship money made available to those athletes and competitors that have large overheads. “Horses aren’t cheap. It costs me about €25,000 a year to run a top level horse and that’s before I support myself or pay for things like sports psychology, nutrition and all the other assets that make the winning difference,” he says. Currently based in Spain, ex photographer turned full time triathlete Bryan Keane has overcome some serious setbacks to get himself race fit for the Olympics. Last September the Corkman was hit by a car while out cycling, breaking his kneecap in the process. “My season has been affected as a result – I’m starting a little late but I hope to be race fit for the end of April or beginning of May. I should be fine,” he says. Keane races Olympic distance triathlons, which involves swimming 1500 metres, cycling 40 kilometres and then running 10 kilometres. Considered one of the most demanding and difficult of Olympic events, it requires special determination to be in with a chance of winning. Keane has been taking part in the triathlon for just three years, but has previously both run and cycled for Ireland and had competed in swimming. He made the choice to switch to triathlon when he realised he could combine his abilities in that discipline and reach a higher level than in the constituent sports. Keane is training full time and says it’s not really possible to train at this level and also hold down a job. “It’s a full time endeavour so sports council funding is extremely important. I’m relying on funding and I have some good sponsorship. We get good TV and media coverage for our events, so that makes it worthwhile to sponsor us, and the prize money is good,” he says. “It costs between €35,000 to €40,000 – it’s expensive, but not compared to sailing or horse riding. Kinetica, a nutrition brand, has been very good to me not just with financial aid but also in lending me a nutritionist. I’m also sponsored by a bike shop in Ireland, so I do all right,” says Keane. For most people sailing is a sedate and relaxing hobby, but not for 21 year old Olympic hopeful Annalise Murphy. Racing laser radial dinghies is a passion that has lead her to the top of her discipline and to within reach of qualification for the 2012 games. Murphy recently cracked the top ten world ranking list for the first time, after coming fourth in her event in the latest round of the International Sailing Federation’s World Cup in Miami. Now ranked ninth in the world, she has deferred finishing her science degree in UCD to pursue her Olympic dream. “There are eighteen months to the games and that seems like both a long time and no time at all to me. I’ve basically been sailing full time for the last two years and the time has just flown by. It’s gone so quick I can’t believe it,” she says. The Rathfarnham based woman has clocked up some very respectable wins in the time she’s been sailing full time. In July 2009, she became the first Irish sailor to win a Europa Cup event in 13 years and later that year at her first world championship as a senior in Japan, she won the under-21 world title. In 2010 she picked up wins in Brisbane and Melbourne. “Everything I do every day is geared towards getting as good as possible in advance of the 2012 Olympics. My parents and some family friends are covering most of the bills, and I get a grant from the Irish Sports Council because I was eighth at the world championships in 2009, and that makes a huge difference. But sailing is a hugely expensive sport,” she says. PANEL OUT: Annalise Murphy, Sailing. I’m really enjoying the theme/design of your site. Do you ever run into any internet browser compatibility issues? A couple of my blog readers have complained about my website not operating correctly in Explorer but looks great in Chrome. Do you have any suggestions to help fix this problem?